Kourtney Grantz (17) prepares to spike a shot after having it set up for her during the match against Santa Monica on Oct.3. The Bakersfield College volleyball team is off to a slow start this season, dropping their last two matches at home. The first loss came on Oct. 1 against Santa Barbara College (9-4) in four sets. The Renegades (4-9) were offensively led by Courtney Grantz with 13 kills. Tyler Herring and Stephanie Lugo would have 12 and 10 kills respectively. Jade Degadillo would lead the team with 18 assists. Lorena Ramirez led the team with 16 digs while Cate Reeves had 13 digs. Bakersfield looked to turn their season around when they opened conference play two days later against Santa Monica College (9-4). 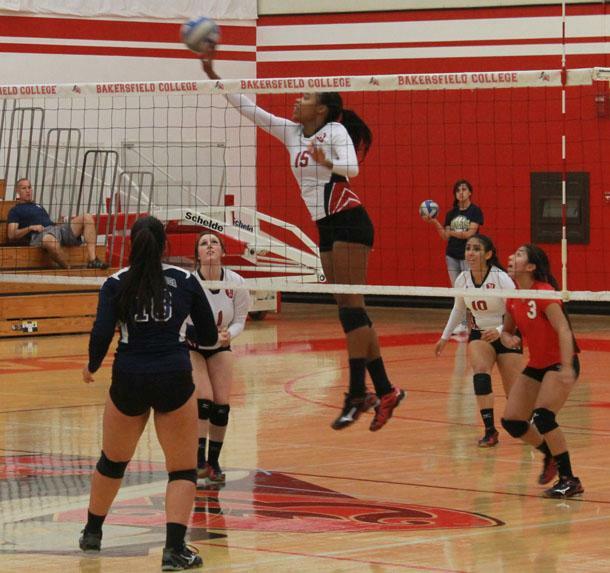 However, the Renegades were defeated by the visiting Santa Monica College in four sets. Courtney Grantz and Tyler Herring led Bakersfield with 14 and 13 kills respectively. Herring would post a match high .524 hitting percentage. Jade Degadillo had 26 set assists and 10 digs. Defensively, Lorena Ramirez led the Renegades with 20 digs and Kayla Romero and Cate Reeves had 12 digs apiece. The Renegades will look to bounce back on Oct. 10 as they travel to Allan Hancock College for their next conference match.